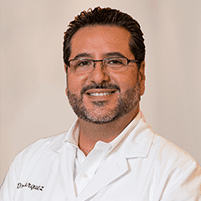 Dr. Fabriel D. Burquez is a trusted and skilled cosmetic and family dentist dedicated to providing patients in and around Chula Vista and Bonita, CA, with the most advanced, safest and most effective treatments for all types of dental issues. At his practice on Otay Lakes Road, Dr. Burquez provides a comprehensive array of care options for patients of all ages, including routine dental cleanings and preventive care, gum disease treatments, fillings, extractions, root canals, crowns and bridges, dental implants, full and partial dentures, and cosmetic options like whitening and veneers. Established in 2007, the practice is equipped with the highest-quality technology, including dental x-ray equipment and CEREC technology for same-day restorations. Since receiving his dental degree from Universidad Autonoma de Baja California, Dr. Burquez has remained committed to expanding his knowledge and experience, completing additional coursework in dental implants as well as maintaining memberships in professional organizations. Dr. Burquez believes strongly in providing the most individualized care based on each patient's oral health needs and treatment objectives. During office visits, every patient receives in-depth information about their oral health issues and treatment needs and options so they can feel confident in the decisions they make regarding their care. His compassionate and caring approach makes even the most anxious patient feel at ease, and his experience treating patients of all ages – from young children to seniors – means each patient can enjoy a continuum of care that will evolve as their needs change over time. Dr. Burquez welcomes new patients, and the practice accepts most major forms of dental insurance. Dr. de Alba graduated from the University of Mexico, School of Dentistry in 1972 and attended UCLA for his Certificate in Orthodontics, which he obtained in 1975 as well as his Master of Science degree in Oral Biology in 1977, also from UCLA. In 1980 and for the next several years he held the position of UCLA Postgraduate Orthodontic Clinic Director, UCLA Associate Professor with tenure, and was recipient of many awards. Amongst them are "Best Instructor Award" by the Senior Student Body at UCLA School of Dentistry, Omicron Kappa Upsilon-Dental Honorary Society, American Dental Research, Sigma Zi Honary Research Scientific Society of North American. Other awards, memberships, and recognitions include: American Associations of Orthodontists, Pacific Coast Society of Orthodontists, American Dental Association, California Dental Association, San Diego County Dental Society. He served as President for the UCLA Orthodontic Alumni Association and holds honorary membership to the Parana Orthodontic Society in Brazil. In 1984, Dr. de Alba, decided upon starting a Private Practice and thereby, retiring from his academic career at UCLA. He eventually opened his office in Chula Vista, CA in 1985 and later on in Coronado, CA as well. Practicing what he preached in Academia, Dr. de Alba created two of the most successful Orthodontic practices in San Diego over the past 28 years. Dr. de Alba eventually sold his practices and retired from Orthodontics in January 2008. After 5 years in retirement, Dr. de Alba hass decided to come back and practice Orthodontics exclusively once again but this time on a part time basis. He now works for The San Diego Children's Dental Health Center one day a month and has a one day a week private practice in Bonita, CA. We love what we do and we are here to help you! Taking proper care of your teeth -- from flossing and brushing to routine cleanings and preventative treatment --ensures a lifetime of gorgeous smiles. And when it comes to complete dental health, we provide the highest quality personalized care in a friendly and supportive environment. Using the latest in state-of-the-art equipment, we can detect and relieve practically every dental condition. So make an appointment with us today. Your teeth will thank you. Please access the link below to electronically fill out our new patient forms, thank you! "I was impressed with the efficiency kindness and excellent work of everyone on the dental team. I have and will continue to recommend Dr. Burquez to my family and friends."